Jude Deveraux’s eagerly awaited third novel in her blockbuster Nantucket Brides trilogy continues the spellbinding saga of the Montgomery-Taggerts, set on an island steeped in beauty and unforgettable romance. Even the sight of the private jet she was to take to the island of Nantucket didn’t cheer Hallie up. The interior was tan leather and dark wood, beautifully elegant, and she and Jared were the only passengers. She hoped that the trip would distract her from her thoughts. Before a few hours ago she would have sworn that her stepsister was incapable of doing something so treacherous, as well as illegal. The forged passport, the planned meeting with the famous architect, and the contract signed in an imitation of Hallie’s handwriting all ran through her mind. On the way to the airport she’d asked Jared how he’d first contacted her, and he said he’d sent an overnight package. Hallie’s guess was that Shelly accepted delivery, opened the envelope, read the contents, and decided to take what wasn’t hers. Hallie thought about what would have happened if she hadn’t returned home unexpectedly. Would she have come home from work to find an empty house and a note from her stepsister saying she’d decided to leave town? How long would it have taken her to find out about her stolen inheritance? When they were on the plane, Jared made sure she was belted into a seat, the thick folder of papers on her lap and a glass of champagne beside her. As soon as they were aloft, he stepped away to make some calls, and Hallie started reading about why she’d been left property by a stranger. It seemed that she had an ancestor, Leland Hartley, who had been married to Juliana Bell, whose family—including her sister, Hyacinth—originally owned the house. At the sight of her own unusual name, her interest was piqued. Was this her ancestor? But, no, poor Juliana and her sister had died before either of them had children. Leland Hartley had returned to Boston, remarried, and had one son. Hallie was descended from him. Henry, the man who’d willed the house to Hallie, was descended from the Bell side. He had no immediate family so he’d left everything to Miss Hyacinth Lauren Hartley, aka Hallie. Henry had composed a genealogy chart that traced Leland down to Hallie. She unfolded the long paper and read the names and dates. There was her mother’s death when Hallie was four, and her father’s remarriage when she was eleven. It ended with the death of her father and Ruby—Shelly’s mother—in a car accident when Hallie was in her second year of college and Shelly was still in high school. She looked down at the folder. In the back were some medical notes about her patient, James Michael Taggert, nicknamed Jamie, but they were brief and not very informative. But then Hallie had heard everything before when Shelly was quizzing her about her injured friend. Hallie didn’t want to imagine what would have happened to the man without proper care. Mostly the papers were about the excellent financial terms being offered to her for rehabilitating this one young man. She’d be able to make her mortgage payments on the house her father had left her outside Boston as well as put food on the table in Nantucket. “Me too,” Hallie said, and wondered what his wife was like. He was famous, so he probably had married some elegant blonde who spent all his money maintaining her beauty. It was at lunch—perfectly cooked chicken and salad served by a young woman attendant—that she asked Jared who owned the jet they were on. When he said “Jamie’s family,” Hallie nodded. It looked like her patient was indeed some rich kid. He’d gone skiing, probably in some exotic locale, and torn his knee. Since his family could afford anything on earth, he was being given his own private therapist. Jared had told her that his family had even put in a private gym for the rehabilitation work. No being one of many for him! Hallie nodded and thought, Rich and spoiled. Everything always handed to him. “There’s still time to call,” Jared said. They talked about the physical therapist job Hallie was due to start at a small local hospital, and she told Jared that she’d call and turn it down. Since they had a waiting list, she didn’t feel guilty about it. He said he’d have his super-efficient secretary take care of it for her, and she thanked him. She smiled at the compliment. A lifetime with her stepmother and Shelly had taught Hallie how to hide her emotions. When they landed, in spite of her bravado, Hallie began to feel nervous about what was coming. While it was exciting to think of the adventure before her, it was also terrifying. At twenty-six years old, she’d lived in one house all her life, had gone to college nearby, and had been about to accept a job that was close to her home. She was leaving behind people she’d known since she was born—and that included Braden. She reminded herself that it was her choice whether or not this was permanent. In the little Nantucket airport, she stood to one side and waited for Jared to finish talking to people. Whereas the experience of flying on a private jet was awe-inspiring to her, it didn’t seem to be unusual on the island. In fact, three other privately owned jets had arrived at nearly the same time, and Jared and Hallie’s flight had needed to wait for permission to land. Jared was talking to passengers from the other planes, to the baggage handlers, to the pilots, and to a man who seemed to be the manager of the airport. As far as Hallie could tell, he knew every person within sight. This was certainly different from Boston! Abruptly, Jared turned from them and walked quickly to Hallie. “Come on, let’s go. A tourist plane is landing.” He sounded as though a tsunami was about to hit. He put his hand at her lower back and ushered her out of the airport into bright sunshine and the clean, salty air of Nantucket. It wasn’t until they were in Jared’s truck that reality began to hit Hallie. The vehicle was old and beat-up, and something about it seemed real.The world of the leather-upholstered BMW Jared drove and the private jet was too foreign to her to allow her to think clearly. But now she was grasping the truth of all of it. She was on her way to a house she’d never seen but that belonged to her. And for the time being, she was going to be living with a young man she had never met. As they drove from the airport to the downtown area, Hallie marveled at the houses they passed. They were nearly all clad in untreated wooden shingles that had turned a beautiful, misty gray. It was almost as though she were traveling back in time, to when Nantucket was known for its whaling. It wouldn’t have surprised her to see men in jackboots carrying harpoons over their shoulders. As she stepped inside a little entryway with a staircase in front of her, she didn’t reply. The house was beautiful! It had a feeling of age and memory and coziness that she’d never felt before. “This is mine?” she whispered. Eyes wide, Hallie only nodded in agreement. As he went through the door to the right, she climbed the stairs. At the top was a small landing with open doors on opposite sides, both of them leading into large, furnished bedrooms, each with its own bathroom. Behind them was a little sitting room with a big window looking out to the back. Since the house had belonged to a lifelong bachelor, she was surprised that it looked warm and inviting down to the smallest details. The wallpaper was of pretty woodland flowers, and the antique beds were draped in soft blues and greens, with big downy pillows against the headboards. The window seat had cushions of pale pink and peach, and tassels were on the curtain tiebacks. She went to the window and looked down into the garden—and gasped. Since the front of the house had very little land, she was shocked at what was in the back. There was a big square area, with branches leading off both ways to form a T-shape. There were several huge old trees, and flower beds were outlined. That the beds were nearly empty made her long to get her hands on them. Unbidden, the thought came to her that with Shelly and her mother out of the picture, this garden would never be in danger of being bulldozed. She wondered where she could find the workshop with the gym that Jared had spoken of. Pushing the window up, she looked out to see past the tall fence that surrounded the entire garden. When she heard voices, she pulled back from the window. Walking together were two people. One was a small, older woman and facing her was a man on crutches—and he was close enough that she could see he was beautiful. Not like some model out of a magazine, but in the way of a man who turns and smiles at you and your knees go weak. He had thick black hair, a stubble of whiskers over a strong jaw, and lips of such softness they made Hallie dizzy. When the man smiled at the little gray-haired woman, Hallie could see lines at his eyes. She guessed that he was at least thirty. As for being short, he wasn’t under six feet, and the “stocky” looked to be about two hundred pounds of pure muscle. He was wearing a long-sleeved shirt that couldn’t conceal the curves of the powerful muscles underneath. Below that were sweatpants that draped over heavy quads, and she could see the outline of a big leg brace beneath. That’s who I’m to work on? she thought. But that couldn’t be! Jared had said he was a “kid” and “short and stocky.” But that certainly didn’t describe this man! Hallie moved back to lean against the wall. To say that he was her type was an understatement. She’d always liked athletic, muscular men. “This is a problem,” she whispered. Her teachers, first in massage school and later in physical therapy, had repeated over and over the importance of professionalism. A therapist was never to get personally involved with a client. She’d been warned that some of them would flirt and tease. With her massages and later in her many student sessions, she’d found out that was true. But it had been easy to laugh those guys off. She’d been so concentrated on her work that she’d thought of little else. Besides, she wasn’t particularly attracted to any of them. But this man, this Jamie Taggert, was different. She saw that her hands were shaking, and she could feel beads of perspiration on her upper lip. “Control!” she said as she pushed away from the wall. She took a few deep breaths to calm herself, then went through a bedroom to get to the stairs. At the bottom were two beautiful old doors. One was locked, but the other one led into the living room. The ceiling was fairly low, with great overhead beams that spoke of the age of the house and added to the calm, peaceful feeling of it. A wide, deep fireplace was along the wall, with pretty windows on the far side. The couch and two big chairs were soft and comfortable looking. They had been moved to the far end to make space for a narrow bed and a desk. As Hallie looked at the bed, she wondered how a man with shoulders like his could sleep on it. Did his feet and arms hang over the sides? The thought almost made her giggle. On impulse, she went to the desk. It was old and scarred from many years of use. On top of it were a few neatly stacked paperbacks—murder mysteries written by men—and a big leather date book with a matching pencil holder. Hallie sat down on the little wooden chair, and after a quick glance about the empty room to make sure she was alone, she opened the date book. What she saw made her gasp. Inside were large, glossy photographs of Shelly. On top was one of those professional-looking head shots. Shelly just out of the shower was beautiful, but fully made up, her hair swept to one side, a seductive little smile on her perfect lips, she was a stunner. Beneath that were composites of other shots. There was Shelly riding in a convertible, her hair tousled, her face turned up to the sun. It looked as though it had been taken on a movie set. Another one was of Shelly in a red silk blouse, open to show her black bra, on what looked like a stage. There was a photo of her holding a bar of soap to her cheek. An ad, maybe? The last picture was a full-length shot of Shelly in a bikini. All five feet eleven of her, not an ounce of fat anywhere, long blonde hair pulled into a high ponytail, and looking like the all-American girl. Every man’s dream. Hallie leaned back in the chair, feeling like she’d just deflated. In all the turmoil of what was turning into a very long day, it hadn’t registered with her when Jared said that Shelly had exchanged emails with the prospective client. But then Hallie’s mind had been reeling from the news that her stepsister had faked her passport and tried to steal a house. Hallie held up the bikini shot. She’d never been able to understand how Shelly and her mother could live on a diet of greasy burgers, fries, and cola and never gain weight. After they’d come into her life, Hallie went from her grandparents’ fresh vegetable diet to endless carry-out and she’d begun to pack on the pounds. In school, playing soccer had kept most of the weight off, but after her father and stepmother died, Hallie’d had the job of supporting Shelly. She didn’t have time to cook. It had been work and nothing else. Coming home late at night and eating Big Macs and drinking big colas had left her with an extra twenty-five pounds. Add that to the fact that she was only five foot four and . . .
She didn’t want to think of a physical comparison between her and Shelly. She’d lived with it for too many years. “Both of these girls are your daughters?” people would ask her father. Tall, willowy Shelly and short, childishly round Hallie the product of the same parents? Not possible! Hallie knew Ruby had meant well, but it still hurt. In her family, Hallie was the smart, responsible one who always did the sane, sensible thing, while Shelly was the pretty one who always screwed up and was always forgiven. “Hallie, you need to help Shelly” was something she’d heard on a daily basis. Hallie stood up and carefully put the photos back inside the book. That’s what she got for snooping! She put the chair back under the desk and went into the kitchen—and the charm of it helped to clear her mind. How her grandparents would have loved the old-fashioned appearance of it! The sink was huge, as were the gas stove and the refrigerator. In the center was a square table that looked as old as the house, and it was in front of yet another fireplace. Two of the doors leading out of the kitchen were locked, but a third one led to a pretty little glassed-in porch that was full of white wicker with pink and green cushions. There was a piece of white linen in an embroidery hoop and she picked it up. It had a design of two birds and half of it had been beautifully sewn. She wondered if the late Henry Bell had done it. When she heard the click of a door, then two male voices, she froze in place. One was Jared’s and the other was a deep, rich rumble that made Hallie’s breath catch in her throat. Damnation! she thought. This guy is expecting Shelly and he’s going to be deeply disappointed. Have some sympathy for him. With her shoulders back, she walked into the kitchen and saw him. Heaven help her, but he was even better looking close up. Worse, there seemed to be an energy around him that was like some powerful magnet pulling her to him. Part of her wanted to leap the distance between them and lose herself inside his big, strong arms. But years of practice at hiding her true feelings kept Hallie glued in place, her expression pleasant but neutral. “This is—” Jared began, but Jamie cut him off. “You’re Hallie?” Jamie asked, his eyes wide. “But you’re not—” He broke off to look her up and down in a way that every woman hopes some gorgeous man will look at her. Not in that lecherous way that can make a woman feel exposed and vulnerable, but in a way that made her feel beautiful and so very, very desirable. Jamie grasped the side of the sink, as though if he didn’t support himself he’d fall down. “I thought someone else was coming, but you . . . You’re . . .” He didn’t seem able to say any more. When he leaned against the cabinet, his crutches fell backward, and Jared caught them. Hallie straightened her shoulders. It looked like to him, one female was as good as another. If he couldn’t have the divine Shelly, he’d take this one. But Hallie’d had too many years of guys trying to get near her so they could be close to Shelly. All she knew for sure was that this had to stop now! “Yes, ma’am,” he said softly, his eyes widening even farther. Jamie was blinking at her as he nodded. When he said “Yes,” Hallie could feel his breath on her face. He smelled of man. Abruptly, she took a step back, then walked all the way around the table, around both men, and paused at the back door. She glared at Jared. “Short, stocky kid, huh?” She went outside, closing the door firmly behind her. “Who is the stepsister?” Jamie’s puzzlement showed on his face. “Yes, sir,” Jamie said, his eyes sparkling. 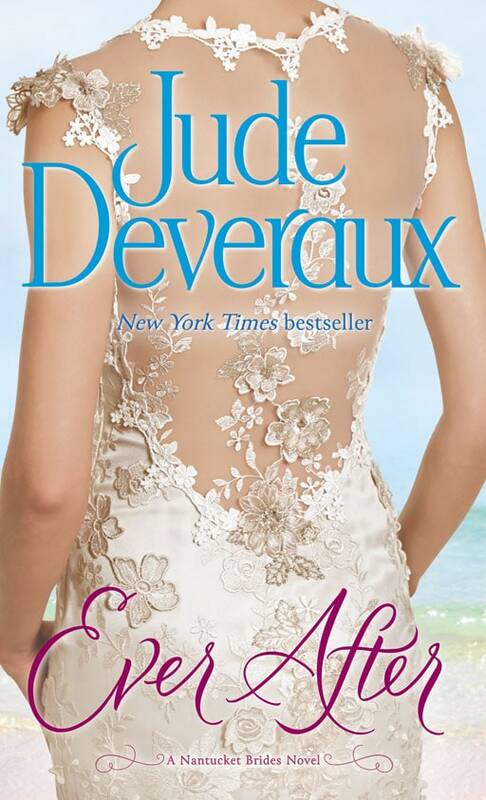 Excerpted from Ever After by Jude Deveraux. Copyright © 2015 by Jude Deveraux. All rights reserved. No part of this excerpt may be reproduced or reprinted without permission in writing from the publisher. View photos that inspired Jude while writing the book. View outlines and other notes that Jude made while writing the book. See Facebook posts that Jude made about writing the book. See notes and images that Jude made while writing the book.